Batteries: Ever Ready B126 or Vidor L5512 (90v HT) & Ever Ready AD38 or Vidor L5048 (7.5v LT). 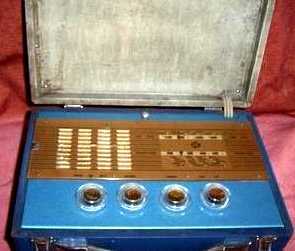 Of all the portable radio manufacturers of the time, Pye seemed to have some of the better designs - like I said. They were certainly not afraid to use brightly polished chrome in their otherwise plain handbag portables.